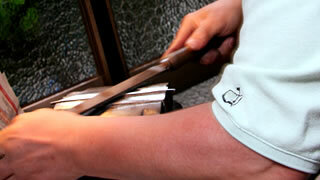 Each and every pair of tweezers is fashioned with a hammer at the Kurata Factory. Flattening the metal with a machine would save time and labor. However, by hammering it, the density of the metal structure increases, making it stronger, resulting in tweezers with a good feel. 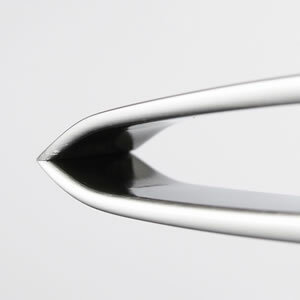 We also take great care of the metal tip that touches the hair when plucking it. If the two tips are not a completely tight fit, thin hairs, like downy hairs, do not get plucked. Therefore, at the finishing stages, as a check, the tips are put together against a light and are then sharpened to the point where no more light comes through between the gaps. 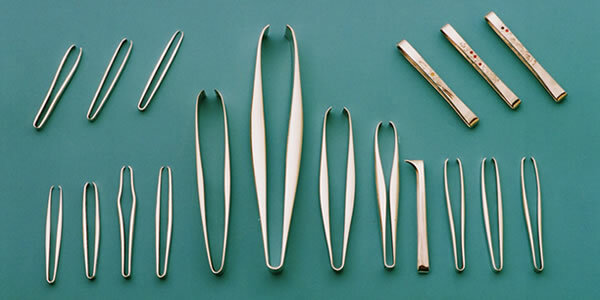 The tweezers come in different types of shapes like "Iroha", "Komaru", and "Hyotan". At Kurata Factory, we devised a more portable "lipstick-type" tweezers, aside from the more traditional forms dating back to the Edo period. 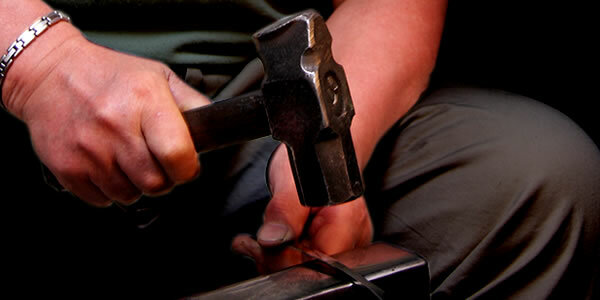 As craftsmen, we always think of our customers first and seek to come up with new designs to suit their needs. The material is mostly 18-8 SST or 18 chromium type stainless steel, but depending on the situation, sometimes it is gold or silver. 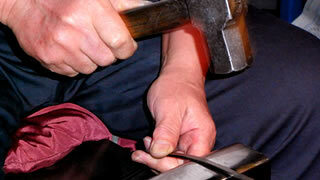 First, the material's two ends are straightened with a hammer. Then through a process called "core removal", the central part, which will form the spring of the tweezers, is hit to take out its core. Afterwards, the whole piece is hammered again to break it into a flat shape. After die cutting the superfluous parts to the sides, a file is put to the cut sides. The file is applied at an angle to the side and small unevennesses are carefully removed. Then, it is polished with three types of buffing materials (sand, hemp, cloth). After fixing minor bends on a wooden workspace, the maker's signature is engraved. An arch is put into the piece again. 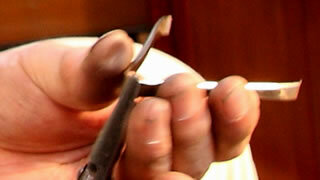 Then comes the part that pinches the hair (blade making), the tip is bent into the shape of a pair of tweezers and adjusted. 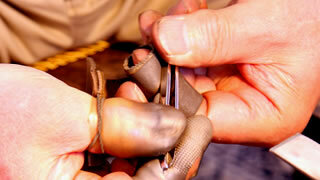 The central part, which had its core removed in the first step, is bent with a plier and later hammered into shape. The surface is made smooth with four types of buffing (sand, hemp, string, cloth). The "blade" which pinches the hair is filed by three files, rough, semi-rough, fine, in that order. After the shape and resistance (spring) is adjusted, the gaps between the two tips are eliminated by checking them against a light. Finally, a whetstone is applied against the tips as a final touch for completion. We received a letter from Mr. K, a resident of Fukuoka Prefecture, who has been struggling for years with inverted eyelashes. We were given a description of the nature of his symptoms, as well as a request for tweezers with a round and gentle tip. After corresponding back and forth a few times, creating and sending a test sample, Mr. K's completely removed eyelashes (with the hair root), a thank-you letter and even a specialty from the region arrived in the mail. It took about half a year to complete, but if the customer is this happy, there is nothing more a craftsman could ask for. We received a request from Mrs. Y, living in Osaka, saying, "with regular tweezers my grip is not strong enough to remove hair. Could you make something that would easily work for someone like me?" 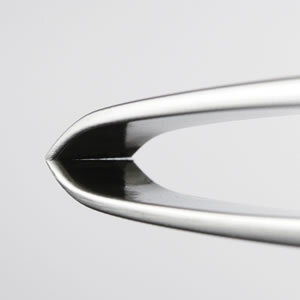 So we adjusted the part of the tweezers that functions as the spring, making adjustments in the "core removal" step of the process, to make a pair of tweezers that clamp together well, even with a weak grip. Thus, we were able to fulfill our customer's wishes. A dog lover from Tokyo, Mr. M made an order for a pair of tweezers for his dog's inverted eyelashes. In this case, we used the instance of Mr. K from Fukuoka as a reference, to make a pair of tweezers that met the customer's request. Since then, we receive a new year's greeting every year with a photo of a happy dog. We received an order from the head chef of a famous hotel in Tokyo, for a pair of tweezers to remove fine bones from fish. We have always made bone removers, but since this was specifically for fine bones, we put in extra care and time into adjusting the tips. The chef continues to use our tweezers today.